With many leading owner-breeders and big-spending buyers having horses in training in France, maiden races held in the country often attract candidates with impeccable pedigrees. The Prix du Mont Cenis for unraced three-year-old colts and geldings at Chantilly on Sunday (2.15pm BST) has certainly attracted its fair share. Among the ten runners declared for the mile contest are Parabellum, the most expensive horse ever sold by Arqana, and Oshayger, who is out of a winner of the Breeders' Cup Filly and Mare Turf, both trained by Andre Fabre. Co-bred by Lady O'Reilly's Skymarc Farm and Ecurie des Monceaux, Parabellum is by Dubawi out of the stakes-winning Montjeu mare Pacifique, winner of the 1m7f Group 3 Prix de Lutece at Longchamp. 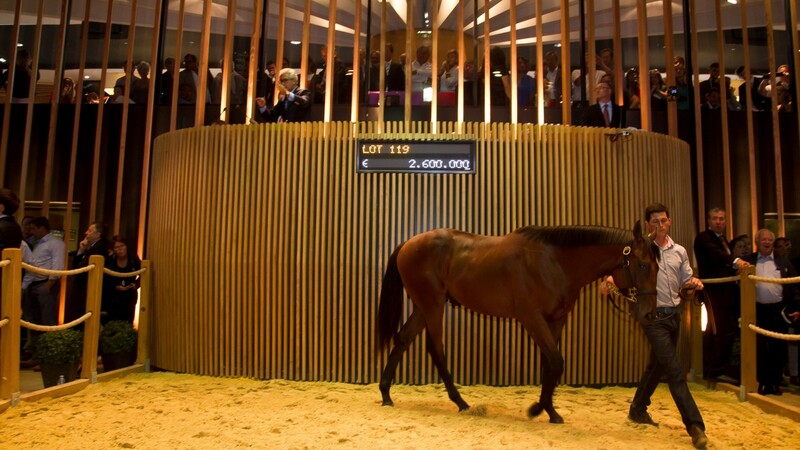 The colt, who will be ridden by Mickael Barzalona, made history at the 2015 August Yearling Sale when purchased by John Ferguson for €2.6 million. That is not the only sale-topping sum realised by the family as Prudenzia - a Listed-winning half-sister to Pacifique - produced the Irish Oaks winner Chicquita, who became the most expensive thoroughbred ever sold in Ireland when she made €6m as part of the Paulyn Dispersal at Goffs. Pacifique and Prudenzia are out of a winning half-sister to both the Yorkshire Oaks runner-up Pongee, and a Listed-winning son of Montjeu in Lion Sands. Pacifique also has an unnamed two-year-old Redoute's Choice colt and a yearling Invincible Spirit filly, both in France. An Al Shaqab homebred, Oshayger is by Frankel, responsible for a host of three-year-old winners from his first crop, out of the Green Tune mare Zagora. Zagora was trained in France by Jean-Claude Rouget, who won two Group 3 races with her, before she was transferred to the care of Chad Brown in the US. Brown developed her into a dual Grade 1 winner, with her most notable win coming in the 2012 Breeders' Cup at Santa Anita at five. Zagora is a half-sister to the Group 2 UAE Derby runner-up Asmar, and the pair are two of six winners from seven runners out of the unraced Mtoto mare Zaneton. She was sold to Al Shaqab Racing for $2.5m at Fasig-Tipton three days after her Breeders' Cup success. Oshayger will be ridden by Gregory Benoist, Al Shaqab's main rider in France. Zagora also has a two-year-old filly by Galileo and a yearling filly by Toronado. The Fabre-trained pair are likely to receive plenty of support on the PMU. However, another runner with more of a mile pedigree is the Flaxman Holdings homebred Ratiocination, who is by Excelebration out of Prix Marcel Boussac winner Denebola. Excelebration was a top-class miler, winning three Group 1s, and finished runner-up to Oshayger's superstar sire Frankel on five occasions. Oshayger, Parabellum and Ratiocination all hold entries in the Prix du Jockey Club, while the latter two also have entries for the Poule d'Essai des Poulains in May. Fabre is also represented in the equivalent maiden for unraced three-year-old fillies, with Ma Cherie, a Galileo half-sister to Zagora, declared for the Prix de la Lancette (1.05pm BST). Ma Cherie is out of the unraced Zaneton, who has produced six winners from seven runners including the aforementioned Zagora and Asmar. She also has a two-year-old colt by Dansili and a yearling colt by Siyouni. Ma Cherie is likewise coming up against some interesting newcomers, headed by Frame Of Mind, a daughter of Safari Queen who was a dual Group 1 winner in Argentina and also the winner of multiple Graded races in the US for trainer Todd Pletcher. Safari Queen is by Invincible Spirit from a prolific family of Argentinian Group 1 winners including Safari Miss, Safari Girl and Sally Girl. Safari Queen has produced three winners from three runners to date, including Prix Saint-Alary heroine Queen's Jewel - who finished third to Stephanie's Kitten in the 2015 Breeders' Cup Filly and Mare Turf - and dual Listed scorer Royalmania. She also has a yearling colt by Deep Impact named Carvali in France. Both Frame Of Mind and Ma Cherie are entered for the Poule d'Essai des Pouliches, while the latter is also entered for the Prix de Diane and Prix Saint-Alary.